If you are looking to add some variety to your everyday chapati or roti, try adding different grain flours. This Multigrain Chapati recipe (Multigrain Roti Recipe) incorporates 5 different grains to give a delicious rustic flair to regular chapati. You can find these flours at either your local Indian grocery store or whole foods/bulk store. Mix Salt and Water (little at a time) to form a soft dough. Knead for 3-4 minutes and coat dough with a few drops of oil. Cover and allow dough to rest for 10-15 minutes. Using dry chapati flour for dusting, roll out one portion into approx a 6 inch disc. Cook one side of chapati on a hot skillet or tawa on medium heat. When bubbles form, flip chapati to the other side and cook for 30 secs or so. Increase the heat to high, pick up chapati with tongs and flip it over onto the open flame (allowing the chapati to puff). Continue to flip the chapati until all raw dough disappears. 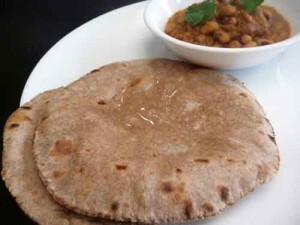 Place chapati in an insulated container and smear with clarified butter or ghee. Repeat process for remaining dough balls.